The revolutionary struggle of the cherries was squashed as they were trapped between two layers of chocolate. May their memory live on in your mouth! Silly! But together with a picture of a violent long-dead Communist these words apparently have the power to sell sweet frozen dairy fat to hungry Aussies. Maybe that's because this picture is an icon, an icon that can be called to the service of either socialism or capitalism. This picture has been used on bottles of beer, condoms, bikinis, bubble bath and countless t-shirts. It has been part of Smirnoff vodka ads and fake Andy Warhol prints (which Andy claimed to be his own work anyway). The picture has been used by leftist politicians in Latin America and right-wing religious fundamentalists in the Middle East. In parts of Miami this is a picture of the devil himself. Here's the original photo as taken by Cuban photographer Alberto Korda in 1960. The facts of Guevara's life provide only a starting point for explaining the picture. After becoming famous in the Cuban revolution Che pretty much bounced from job to job failing to make good as a bank president, a prison commander or a guerrilla revolutionary. He tried the last gig both in Africa and South America finally getting martyred for his trouble. Today, in parts of Bolivia, he is known as "San Ernesto"
If ever there was an illustration of the anguish evoked in sensitive and reasonable, but far from exceptional, individuals, at being affluent and comfortable islands in a sea of destitution, it was Guevara. He will endure as a symbol, not of revolution or guerrilla warfare, but of the extreme difficulty, if not the impossibility, of indifference. 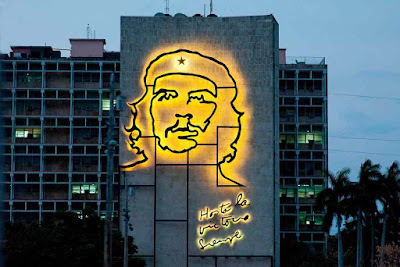 Che's Afterlife shows how the picture has avoided contradicting itself into meaninglessness. Explaining what it does mean is no easy task. It functions as the universal symbol for the act of following one's convictions. Until Cuba joined the international agreement on copyrights the image was public domain. 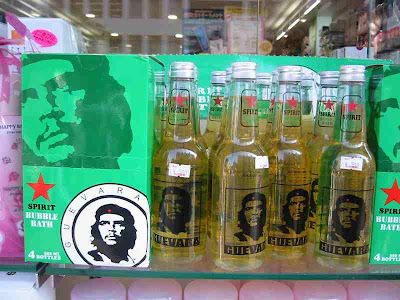 Now Che himself is licensed commercially just like Marilyn Monroe or Albert Einstein or any living or dead celebrity. Branding is a trendy buzzword right now. People are trying to apply this marketing concept everywhere and anywhere they can. Che's Afterlife wastes no effort discussing brand concepts. 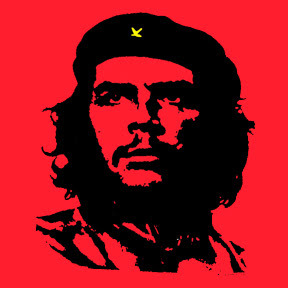 Che Guevara has become a brand and Korda's picture is its logo. Nike is a brand with a swoosh as logo; McDonalds has golden arches. 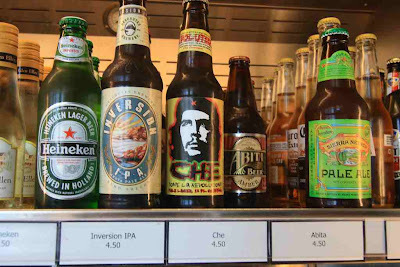 The guardians of these brands - Korda's and Che's descendants together with the Cuban government on one hand, corporate executives on the other - try to preserve its value and focus its meaning by controlling where their brand appears. They decide which contexts, products or events should be associated with their brand and which should not. Here's a picture of Che Guevara bubble bath. 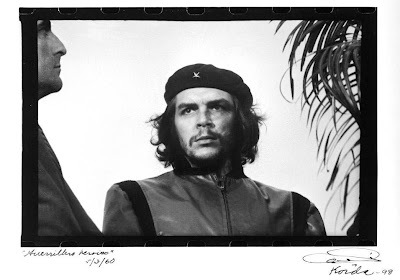 The very pose of Che in the Korda photograph - a somber man, looking slightly up and off into the distance, imagining a better future (or maybe dreaming of a soak in the tub) - is reminiscent of an important graphic from recent U.S. politics, Shepard Fairey's Hope poster. Here it is slightly modified. With the recent change in the U.S. government many people are hoping for a change in the brand image of United States of America. 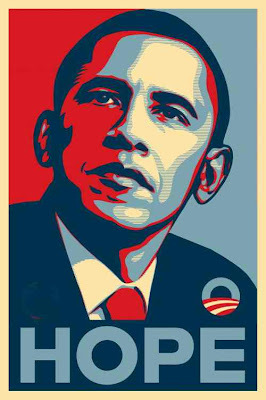 There's no doubt that intelligent, thoughtful pedantic people are bending Barack Obama's ears with suggestions on how to portray America now that the dark ages are ending. You can read some suggestions for Re-Branding America here. This picture comes from that page. 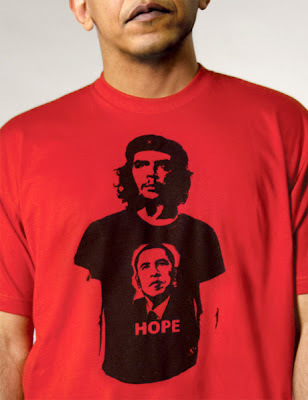 I found the Obama-Guevara-Obama t-shirt picture and the Hasta la Victoria Siempre picture (the neon Che) at This Isn't Happiness. 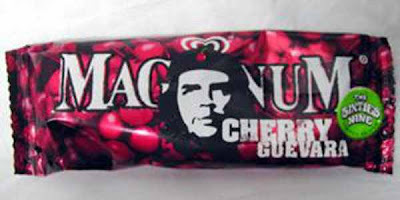 The photo of the Cherry Guevara ice cream wrapper (and many other Che-ish graphics) can be seen here. The Che beer picture came from here. The Che bubble bath picture came from here. Here's a documentary about the life of Che Guevara. 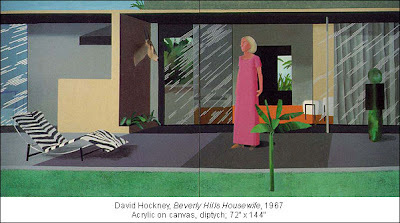 The first time I saw David Hockney's painting Beverly Hills Housewife I scratched my head. "That's not very well done." I thought. I didn't say anything out loud, of course, because the picture was hung in the home of the late Betty Freeman, LA's one-of-a-kind music patron, who is supposed to be the person in the painting. She had asked me to her Musicales for the very first time and I wanted to be invited back. Today I read this LA Times article that the painting has just been sold for $7,900,000. Seven point nine million dollars! I'm scratching my head again. If Hockney's intention in painting this picture was to keep me confused, he is indeed a very great artist. He couldn't have been out to prove what a fine painter he was. Technique seems to be the least of his concerns. Maybe he was trying to point out the banality of Beverly Hills life, picking subjects that the wealthiest buyers of art could relate to. Most likely he was focused on marketing himself as a painter. I guess he was developing his brand. Branding adds value to a low value object and, given this outrageous price for a not terribly decorative object, Hockney must be quite the master at adding value. His real art seems to be selling himself. Actual painting? Not so important. Do I sound bitter? I am. I sense that the value of art results more from the importance of the artist than from the artwork itself. And I sense that the a person's salary has more to do with manipulating the system than with creating a useful product. Our culture can be such a great disappointment to me. I've ragged on David Hockney before - on the subject of music. Here's an Art Talk by Edward Goldman (a bit of borderline-pretentious KCRW filler) on the subject of Betty and this picture.